New York Comic-Con is just around the corner, and CBLDF is ready to welcome fans to NYC with the CBLDF NYCC Welcome Party and the CBLDF Liberty Annual Signing and Release Party! First, join CBLDF at Forbidden Planet (832 Broadway, New York, New York) on Thursday, October 8, 6:30 – 7:30 p.m., for the CBLDF Liberty Annual signing with Fred Van Lente, Sina Grace, Bob Fingerman, R Sikoryak, and other fantastic creators! After the signing, we’ll wander mere blocks away to the Village Pourhouse (64 3rd Avenue, New York, New York) for the CBLDF NYCC Welcome Party and CBLDF Liberty Annual Release Party! Guaranteed to be one of the best parties at NYCC, the party begins at 8:00 p.m., and fans will have the chance to mingle with comics superstars! The party is free to CBLDF members ($10 suggested donation for non-members) and features drink specials, door prizes, and gift bags for attendees. 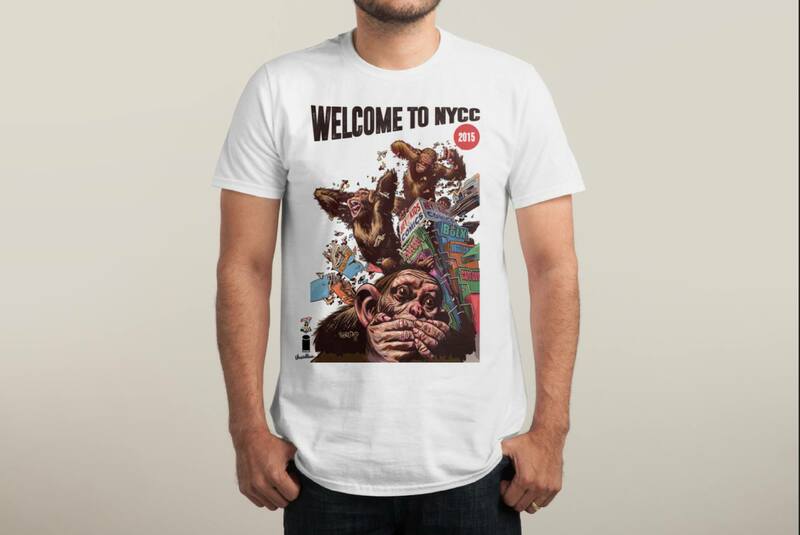 The first 30 people through the door after 8:00 p.m. with take home an exclusive t-shirt featuring artwork by Duncan Fegredo, courtesy of Threadless! To RSVP for the CBLDF NYCC Welcome Party, visit the event page here. On Friday, October 9, 8:00 p.m., don’t miss the Image Comics NYCC Afterparty at Bowlmor Times Square (222 West 44th St, New York, New York)! Mingle with special guests Adam McGovern, Alex de Campi, Amy Reeder, Antony Johnston, Ben Mackey, Bob Fingerman, Brandon Montclare, Brian Haberlin, Brian Joines, Brian Buccellato, Brian K. Vaughan, Cliff Chiang, Declan Shalvey, Ed Brisson, Edwin Huang, Frank Barbiere, Ilias Kyriazis, Ivan Brandon, Jason Shawn Alexander, Jay Faerber, Jim Mahfood, Joe Eisma, Joe Harris, Joseph Keatinge, Justin Jordan, Kieron Gillen, Kyle Higgins, Leila del Duca, Martin Morazzo, Matt Wilson, Michael Moreci, Nick Dragotta, Ryan Browne, Sean Lewis, Steve Orlando, Stuart Moore, Wes Craig, and more (list subject to change)! A portion of proceeds from this party benefits CBLDF. RSVP here. While you’re at NYCC, don’t miss CBLDF at booth 1764, where we’ll have signed books, posters and prints, and apparel on hand for fans old and new!